Remember those running goals I committed to this past spring? 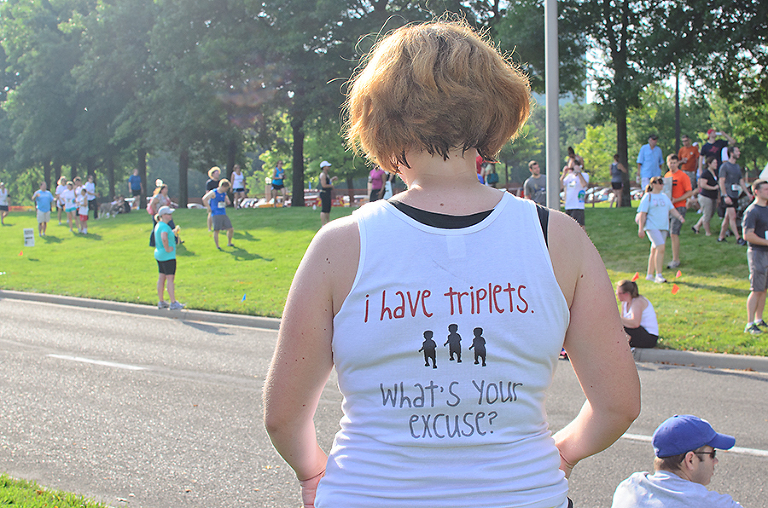 Well this past Saturday I checked off the first goal – run a 5K! In March I started the popular Couch to 5K program (for the 3rd or 4th time) and I finished it up last week. All spring I ran with 2 friends, but our ability to meet for runs has come pretty much to a screeching halt since our older kiddos got out of school. I’ve persevered though and continued to run (either early in the morning before Nick leaves or in the evening when he gets home)! I’ve run and I’ve run and I’ve run. My 5K goal was to finish at 35 minutes or better. I had been running 11:15 minute miles while training, so I figured 35 was do-able. I can’t remember exact times, but I think my first two 5Ks (4 and 6 years ago) were around 36 minutes. Guess what? I finished Saturday’s race in 32:25! Pretty sweet, huh? I snagged the tank over at the Triple Dip Shop! I had several comments before, during and after the race. One woman asked if she could use her cats as an excuse because they woke her up at 2am. Ha! I have to give a shout out to the friends I ran with too! Jamie (who I’ve been training with all spring) finished almost 3 minutes ahead of me – go, Jamie! Our friend Joslyn really kicked some tail and earned herself a little bling when she snagged 3rd place for our age group – woohoo! And our friend Jennifer (who blogged about her breast cancer battle, last fall) finished a couple of minutes ahead of me too. You ladies are awesome! Alright – so what’s next on the goal list? Finish a 10K! I have a mid-September race in mind and tomorrow morning will begin my training. I’m going to try out the Jeff Galloway 10K plan, but went ahead and skipped to week 3, seeing as I was already consistently running over 2 miles. I’m excited about taking this on! 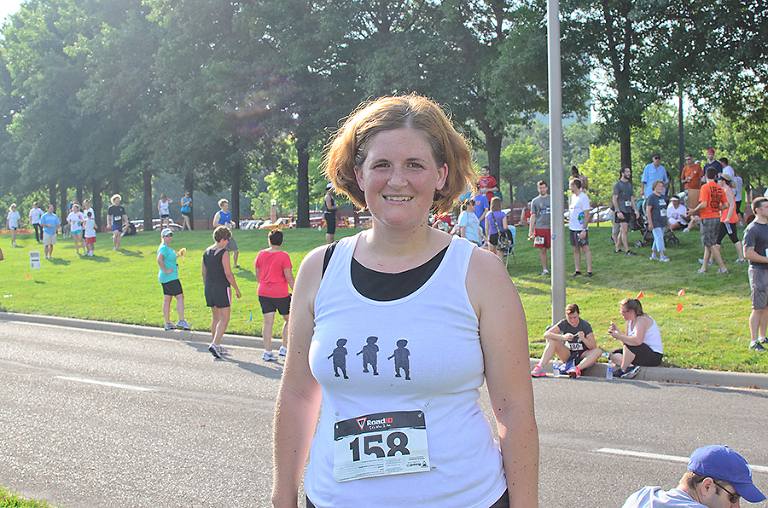 While the 5K was exciting (especially the finishing time), it wasn’t my first race. I’ve never run more than a 5K though, so trying to double it will be a great challenge. Congrats, Helen! I love your tshirt, too! I use the RunKeeper App and just load my runs into that. There was a good looking 10K App I found, but it’s only on iPhone and I have Android.